Most people looking for a newly built home will want a perfectly spacious family home with lots of light and a no fuss construction process. Ideally, the design and implementation will be budget friendly and there will be no unexpected costs. But all too often, the process of buying and building a new home is so overwhelming, that style and innovation are sometimes left behind. German architects Pushmann have answered this need by creating the Holzrahmenbau. It's a low-energy prefabricated home that is individually tailored to each owner. It only takes two days for the basic construction on site, and a further two weeks for the entire building to be waterproof with a roof and windows. It has great insulation and is made from recycled raw wood. But as visual people, here at homify, we really just love the look of this home. It could easily be mistaken for a custom built home with it's simple, minimalist style. Come with us on a photo tour to explore its features. Enjoy! Prefabricated homes are known for their contained and almost block like masses. 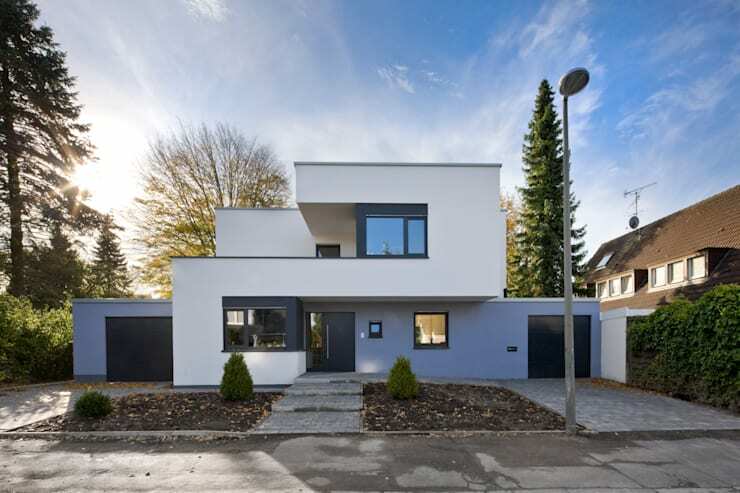 But the contemporary facade here in mute blue and white almost works like a series of interconnecting cubes. The winding, snake-like expanses of white really lead the eye around the home. It's a beautiful entry and one with real interest. In many homes, the garage is visually isolated from the main building. But here we can see how this garage has been perfectly integrated and presents as one complete picture. Note here how the lower level of this two level home has been painted a mute soft blue and the white upper level really dominates. The overhang and height adds an impressive look to the home. We dare to say that no family home is complete without a staircase! 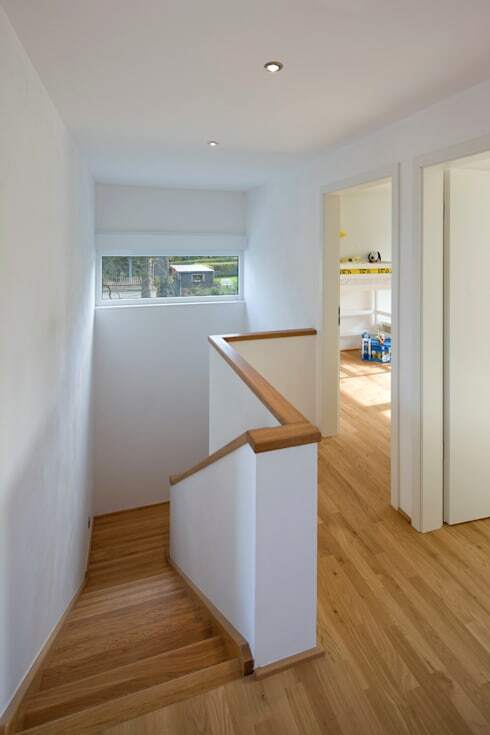 Weather you believe this or not, we reckon that all young kids will love running up and down a staircase like this. The golden timber floorboards, lofty height of the stairwell and the bright light from the large windows creates a friendly atmosphere here. The picture is proof that prefabricated or modular homes can be just as stylish and contemporary as any others. In fact, the simplicity of factory made materials really lends itself to the contemporary, minimalist look. In a contemporary home without all the fussy detailing of older style designs, the raw materials are really allowed to shine. 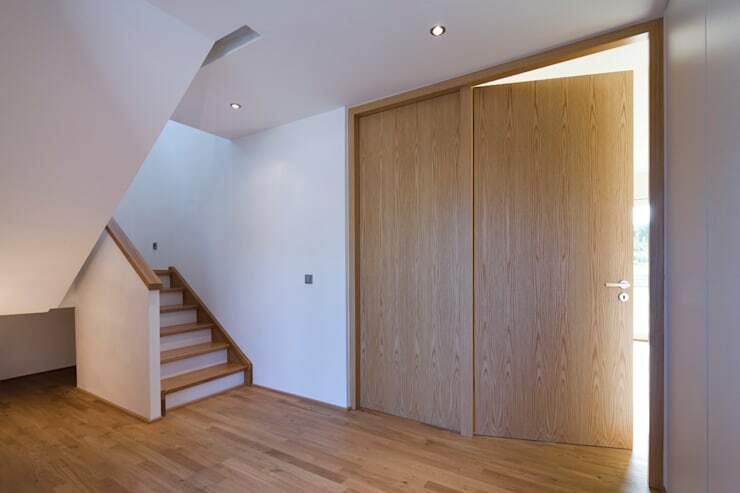 See here how the beautiful recycled timber floorboards running down the staircase and the huge timber folding doors add a whole lot of natural warmth and sophistication. The emphasis here is on quality, environmentally materials and finishes rather than quirky designs. 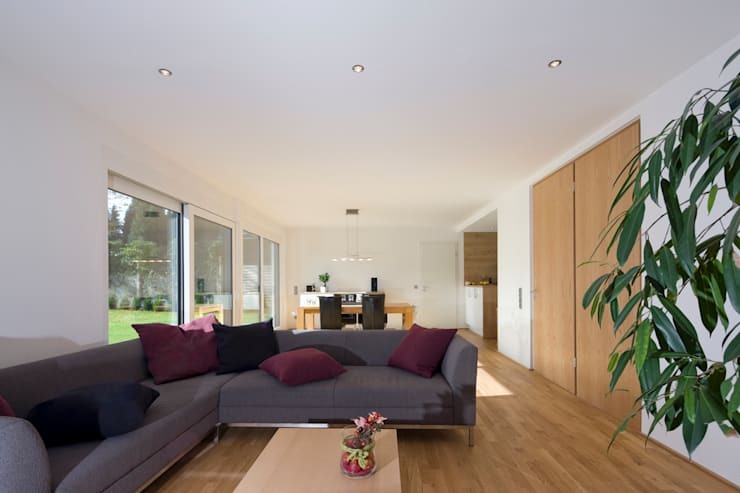 Open plan living is all about simple living. Here we have the one central living area in which the owner can arrange their furniture into their own preferred configuration. Floor to ceiling sliding glass doors allow a whole lot of light to enter the space. The natural timber doors, floor and kitchen walls add all the subtle decoration you might need. But if you want more, the basic construction is a fine palette on which to start working your magic. From this angle, we can see how the architects have dealt with the transition to the back garden area. The large glass sliding doors allow for lots of possibility of further integrating the two areas. Perhaps a sunshade or an outdoor dining set could be installed. Perhaps an outdoor barbecue or even kitchen area could be added. This is the nature of prefabricated housing, creating a template for the new owners to think big. If you are interested in new homes, you would love this Ideabook A Leisurely Home Full of Light and Style. 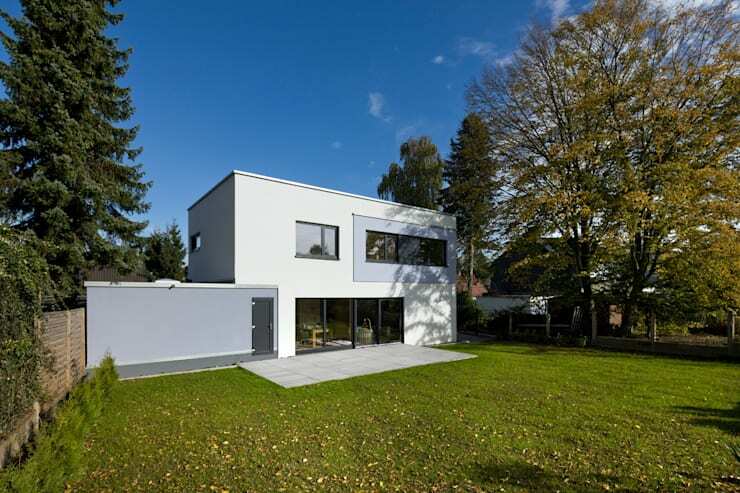 What do you think of this light-filled family home? We would love to hear in the comments below.